Struggling with periods of anxiety? These reflection turn to the Bible as a response to anxiety. You’ll find comfort, hope, and the strength to turn to God. A book of 24 undated reflections drawing on a range of relevant Bible passages to offer genuine hope and encouragement in anxious times. Encompassing the very human emotions of fear and anxiety, the reflections encourage us to draw comfort and strength from God’s word even in those times when he seems silent to us. This book acknowledges that trust and hope in God’s goodness doesn’t always come easily, but when embraced we gain the strength to face our fear with courage and confidence. This book is to be savoured, not rushed. As an antidote to anxiety, it will repay a measured reading, just one short chapter a day. – Archbishop John Sentamu. 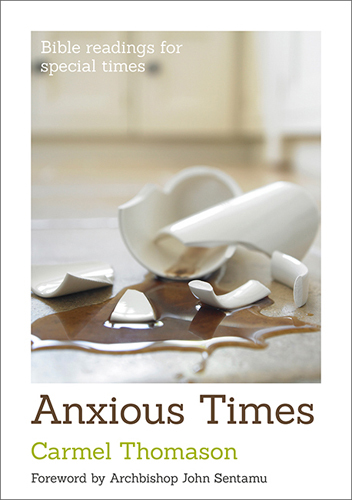 A collection of short reflections that offer a voice of hope against the spirals of anxiety, Anxious Times will encourage you to turn to God when anxiety strikes – Eden Books.